I had the opportunity through Fitfluential to review some YMX by Yellowman clothing. I was sent the Infinite Geometry racing short and the Infinite Sun Bolero. I was most excited to try the Bolero. What I love about the bolero. It is similar to having arm sleeves, but in my opinion cuter and once you want to take them off you can tie them around your waist, instead of just pushing them down or having them tucked in your waistband like sleeves. It also sports a UPF 50! Awesome. 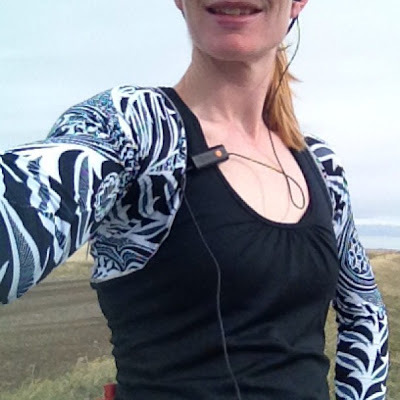 I was afraid I might get some chaffing with the Bolero on my run but I ran 12 miles in it without even a trace of irritation. I was hoping I would get to take it off and tie it around my waist, but it never got that warm out. Boo. I did keep holding out my arms to admire the pattern. and I may have caught myself petting my arms a few times to admire the softness of this material. The shorts are maybe a little bit shorter than I would pick out. They have a three inch inseam. They also run a bit small, but I think a size up would have been a little big in the waist for me. Since it is still cold and snowy here, I still have not had a chance to run in them, but I have done workouts on the elliptical and ZWOWs in them and used them for pajamas. I have long admired the YMX by Yellowman clothing, but never ponied up and bought any because of the price. The Boloero costs $68 and the shorts $86. Now I can see why people would. This stuff is awesome. 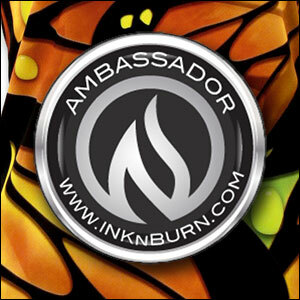 YMX produces limited wearable works of art inspired from tattoo artwork seen around the globe. I don't know what they do to their MadKool fabric but it is buttery soft. It wicks away sweat, doesn't wrinkle easily and dries fast. Also is supposed to be odor resistant. I can attest to my bolero not stinking after my 12 mile run...impressive! I recieved these garments in exchange for a review on my blog. I was not compensated in any other way and was not obligated to give a favorable review. "I may have caught myself petting my arms a few times to admire the softness of this material." - best line ever. I have a YMX top that I won off Twitter. It is so amazingly beautiful. I want more but, like you said, it's a bit pricey. I would also size up in tops. I normally wear a small but got a medium, and it fits perfectly. This is a serious question - we have a ton of stuff at work that has like spf 50, and it's twice as much as other stuff - but sunscreen is like $8 a tube, so what is the advantage to having it included in your clothing? Thank you for teaching me what a Bolero is. That's pretty amazing that it didn't chaff, that was my first thought seeing it. Cool gear! I'm not a shorts girl but that bolero looks super cute!! I can just imagine you holding out your arms to admire the shirt!! Ok, that bolero does NOT look like running clothing! Which means, if it were in my closet, I'd probably end up using it for everything from half marathons to wedding receptions! seriously, that would just as cute over a little dress as it would crossing a finish line. Which might justify the price! Those shorts are super cute! The cut reminds me of some lululemon shorts. 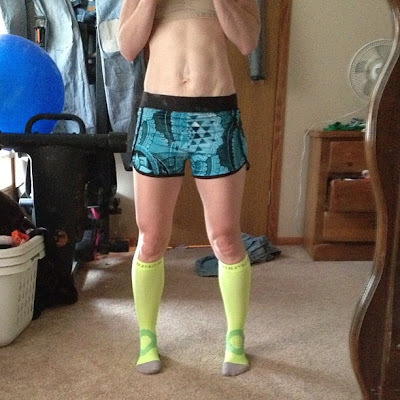 The print is fun and makes them seem not like running shorts too. I would have expected chafing with the bolero as well - cool that they don't! Also, girl you have some fabulous legs (said in a non-stalker tone, I hope :-)). Super cute shorts. I could never rock them that short, but I like the cut & pattern. I love the bolero. I've seen them in a few running stores lately and think they are cute. They remind me of dance apparel which I love. Those shorts would definitely be too short for my taste. But thanks for the review. Oh that bolero is super cute! Always wanted to try YMX stuff but the price tag always stops me. Is the bolero attached to the black tank? I do love the fabric but the price is just so prohibitive. I don't know nothin' about no girly clothes ... so, nice clothes I guess. But did you say SNOW??? Please keep it out West please & thank you. And it sounds so soft and comfy, too! Forget the clothes, check out your abs! Girl that is my goal! You look awesome! 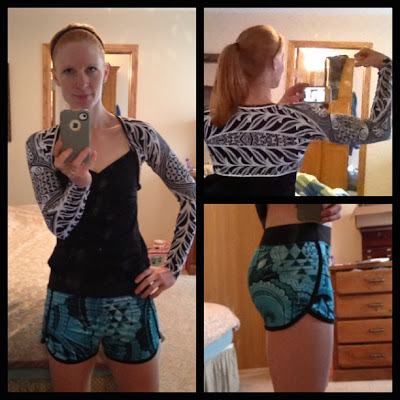 Okay, that Bolero is super cute but so weird to think of it as running clothes! Also must add that you look FABulous. Look at your abs! My goodness! Woman! You've had kids and have an amazing body! Go you! Athletic shorts are the perfect summer staple, but not all styles flatter all figures. Selecting the perfect pair depends a lot on your height, your assets and any problem areas you wish to downplay and the given material for women fulfills all my mentioned features.